I pulled out an old favorite card to wish you a Happy New Years! So what am I stamping on the day after Christmas? Easter cards! Here's a sneak peek of the swap card I am making for the new Occasions catalog starting soon. Come back soon to see the finished product. I used the bow die for the first time on these gift card holders. After that, I was hooked. There are a few ways to put the bow together, and if you flatten it, it will go thorough the mail on a card! Here's a quick thank you note I made to send to the kids in my class. It's 1 inch strip of black paper, a punch of glimmer paper, and a 1 inch square punch and done. Quick and simple but it makes a cute card. My friend, Shirley, designed a gift card tin years ago, and all I remember is it had snowflakes and it was very pretty. So when I bought this Festive Flurries bundle which had stamps and framelits, I knew this was the year to try my own. The snowflake is a version of the one you see in the holiday catalog. To give it the 3-D look, score the middle snowflake 6 times. Punch the center out with the ½” circle punch. Score fold lines so there are peaks and valleys and scrunch to the center to create 3-D snowflake and hot glue in place. Finally you hot glue the third snowflake to the top and a Frosted Finished Embellishment to finish it off. Attach a piece of coordinating Designer paper with sticky strip to the inside of the tin to hold the gift card and now all you need is the gift card! 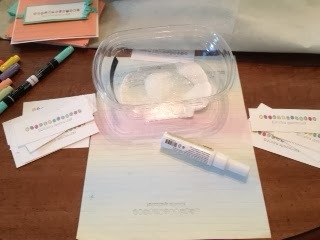 Brenda's tutorial is on Splitcoaststampers.com and made this box very easy to create. She even designed it with a little room for a small candy treat! Not sure the candy will ever make it into mine :-). The Pop' N Cuts Card Base can do so much more than just that one card you see in the catalog! Here I have made a gift card holder. It's similar to one I made some time ago but with the new die, it gives it a slightly different look. Score at 3 ½”, 5 ½” and 7 ½”. Fold like a mountain and punch across the center fold to create hole for the gift card using any punch you like. Attach the bottom with Sticky Strip and assemble and attach bow. 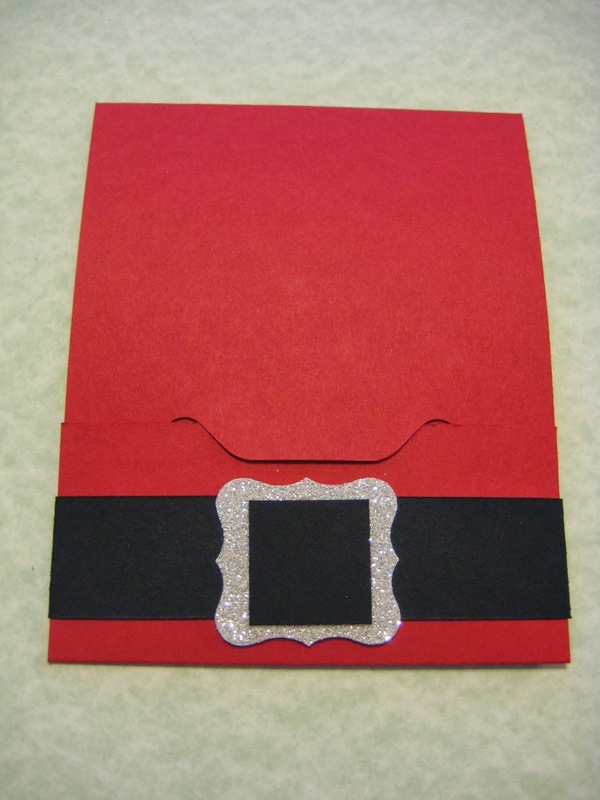 If you were mailing this card, you could easily flatten the bow to fit it in an envelope. I seem to make a red Santa's belt project of some sort each year. This year it may be a card, gift tag and gift card holder! Since the Stampin' Up! envelope punch board came out, I have been seeing all sorts of these gift card projects on Pinterest. I thought the Santa suit would be a perfect way to hold the bottom flap shut and put my own spin on it. Start with 4 ¼” x 11 red cardstock. On 11” side, score at 2”, 7 ¼” and 7 3/8”. Fold on score lines. On the end of the 2” flap, punch with Envelope Punch Board 1” from each side. For insert piece, start with a 6 ½” x 3 ¾” piece of red cardstock. Score at 1 ¾” x 6”. Attach insert piece right above the 2nd of the two score lines. Wrap the 1” wide strip around the bottom of the card. Washi tape would also work, but there must be something there to keep it closed or the finished product will not stay shut. To make the belt the easy way, use a 1" strip of black paper. Then after you punch the glitter paper, glue a 1" black square in the center - no extra punching! By request, I am having a gift card holder class on Tuesday. At first I was a little concerned I couldn't come up with 4 that were different enough. But once I got started, I think I have a little something for everyone. Check back this week for more details on each gift card holder and if you're local, come by and make some for yourself. I had my annual Christmas tag class over the weekend. It's always a challenge to have enough supplies when making Christmas tags since they all use the same basic colors and we need tons of the acrylic blocks. I grouped the tags with like colors together in a box, and it went great. Note to self - remember that for next year!